I know this is a pricey cut of meat but, if cooked to perfection, really is worth it (I’ve been known to lick the baking tray to make sure the last juices go to a good home). This cut of meat needs to be treated with a good deal of respect – don’t interfere with it too much as it speaks for itself. 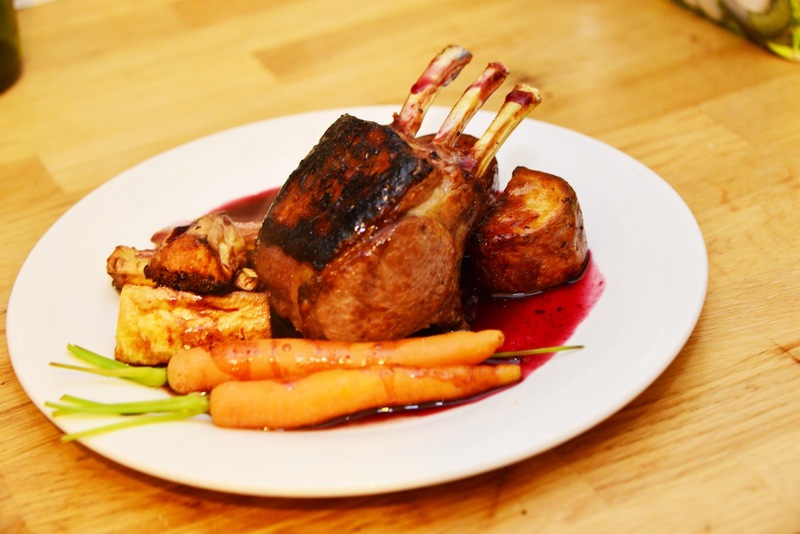 Instead, the dish is all about the red wine jus that accompanies the veg and lamb. Next, and most important of all, do not go to your local supermarket to purchase this joint – it will be overtrimmed and probably from a very small lamb, so you will not get good value for money. Instead go to your local butchers who will look after you considerably better. For example, in M&S yesterday, £19.95 per kg vs Allen’s Butchers in Colchester, £14.63 per kg (and a vastly superior cut of meat, may I add). Peel and cut the potatoes ready for roasting. Place them in a pan of boiling water for 5 minutes. Pour off the water and add to a roasting dish with the goose fat and peeled and chopped parsnips, and pop into a hot oven, around 200c, 390F, Gas mark 6 or on the middle of the top oven of the aga. While these are roasting, cut your rack of lamb in half and lightly coat its outside with salt, pepper and finely chopped rosemary. Place the lamb in a frying pan on a high heat and seal the lamb in the pan. Cook the fatty outside of the lamb first, until golden brown, then seal the inside and end of the meat (you may need to add some pressure with a spatula to get the heat contact with the inside of the rack). Allow the lamb to rest for 10 minutes and use this time to turn your potatoes and parsnips to coat them in the goose fat and return them to the oven. Place the lamb on a roasting tray in the oven on the same shelf as the potatoes. Add a 1/2 inch of water to a saucepan, bring to the boil and place your carrots in it with a knob of butter. While the carrots are simmering, take 2 glasses of red wine and pour them into the hot frying pan, still over the heat, to deglaze it. Add the crabapple jelly and stockcube to the wine and reduce by 50 per cent. After 25 minutes in the oven, remove the lamb, cover with foil and allow to rest for 15 minutes. At this stage, turn the potatoes and parsnips one last time and return them to the oven. By now the carrots should have boiled dry. When this happens, remove them from the heat. Once the meat is rested, plate the meal and give each portion a generous helping of the red wine, crabapple and rosemary jus. It takes some strength of willpower once you’ve finished to stop yourself gnawing the final meat from the bones and end up licking your fingers clean!